Hub is designed for use on trailer idler axles. Fits 6,000-lb axles with #42 spindles. Inner bearing (25580) and race, outer bearing (15123) and race, grease seal, grease cap, wheel bolts, and lug nuts included. Lowest Prices for the best trailer hubs and drums from Dexter Axle. Dexter Trailer Idler Hub Assembly for 6,000-lb Axles - 6 on 5-1/2 part number 42655UC1 can be ordered online at etrailer.com or call 800-298-8924 for expert service. 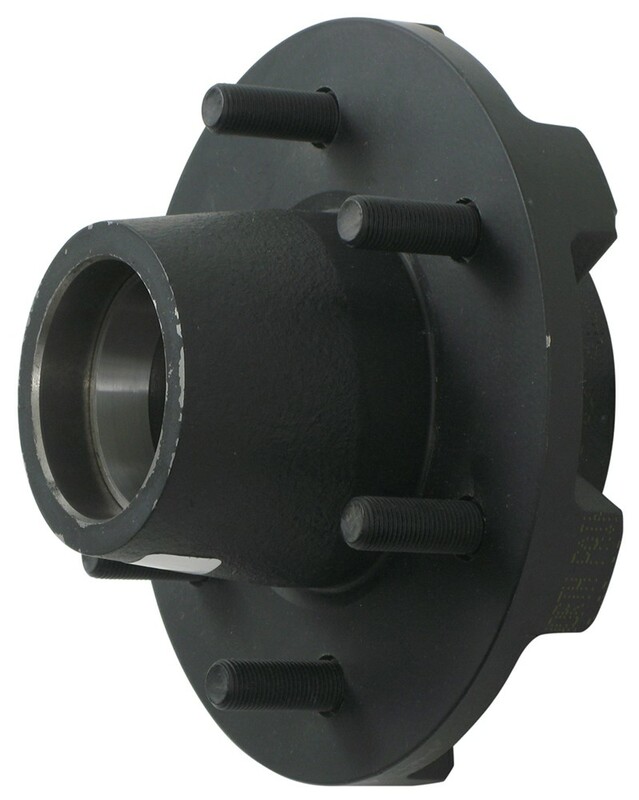 Hub is designed for use on trailer idler axles. Fits 6,000-lb axles with #42 spindles. Inner bearing (25580) and race, outer bearing (15123) and race, grease seal, grease cap, wheel bolts, and lug nuts included. Wheel size: 16" to 18-1/2"
Bolt pattern: 6 on 5-1/2"
Grease cap flange diameter: 2.44"
Measuring the distance (D) from the center of one bolt hole on the wheel to the center of a bolt hole right next to it can also help to determine the bolt pattern. Hub is designed for use on trailer idler axles. Fits 6,000-lb axles with #42 spindles. Inner bearing (25580) and race, outer bearing (15123) and race, grease seal, grease cap, and lug nuts included. Install this hub-and-drum assembly on your trailer. Compatible with electric or hydraulic brakes. Fits 5,200-lb and 6,000-lb axles. Inner bearing (25580) and race, outer bearing (15123) and race, grease seal, grease cap, and lug nuts included. Install this hub-and-drum assembly on your trailer. For electric or hydraulic brakes. Fits 5,200-lb and 6,000-lb E-Z Lube axles. Inner bearing (25580) and race, outer bearing (15123) and race, grease seal, grease cap, wheel bolts, and nuts included. Today, we're going to review part number 42655UC1. This is the Dexter Trailer Hub Assembly. It's a 6 on 5-1/2-inch bolt pattern. This trailer hub will include six of the 1/2-inch lug nuts. 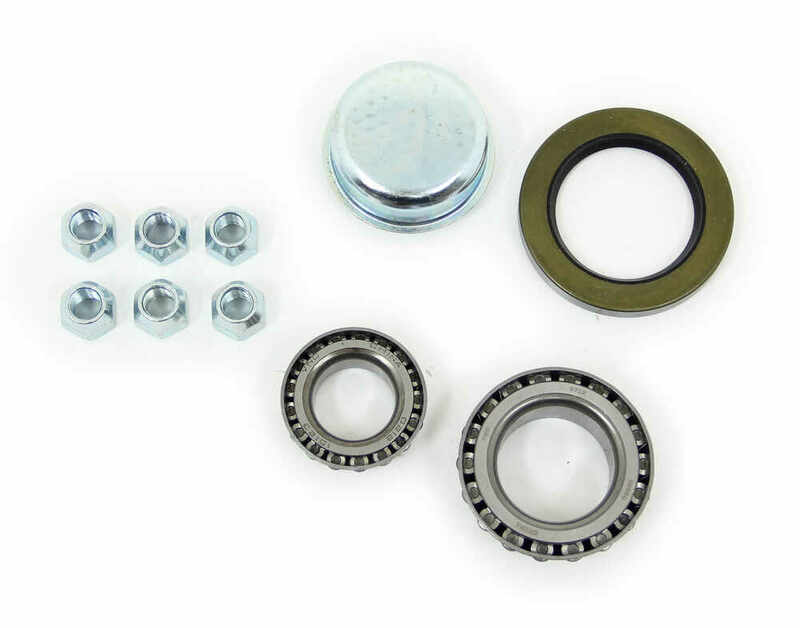 It will include the inner bearing, part number 25580, the outer bearing, part number 15123. It will include the grease cap and the grease seal, part number 42385. 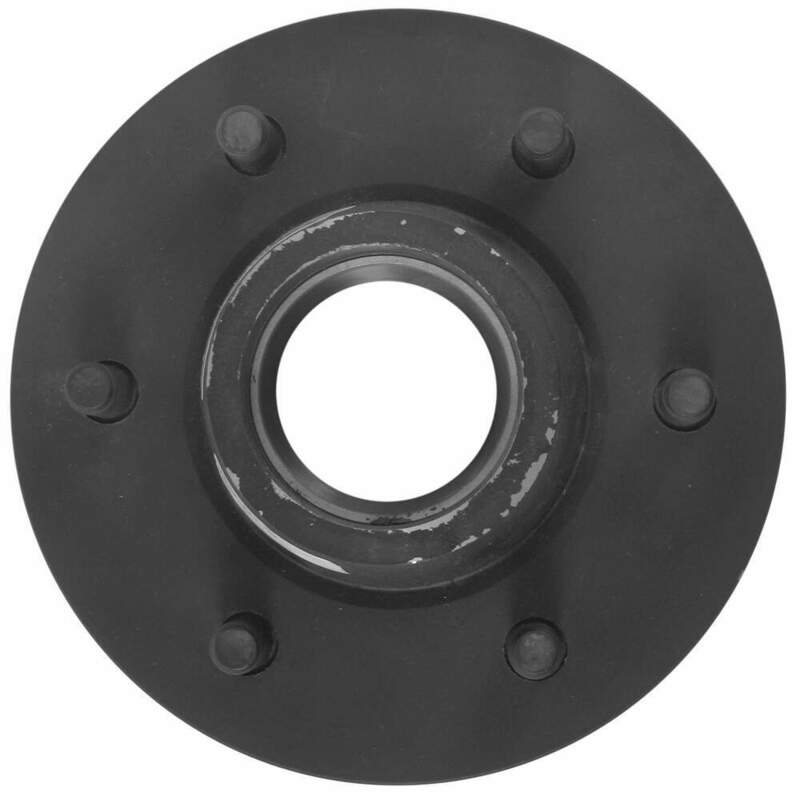 Now, this trailer hub assembly is designed to fit 5200-pound and 6000-pound axles with spindles that will require a 2-1/4-inch inside diameter grease seal. Again, this bolt patter is six lugs, 5-1/2-inch pattern. The capacity is 3000 pounds so when paired with another hub assembly of the same on the other side of the axle, it will give you your maximum of 6000 pounds. Now, the bearing races are included and they are preinstalled and pressed into the hub already. 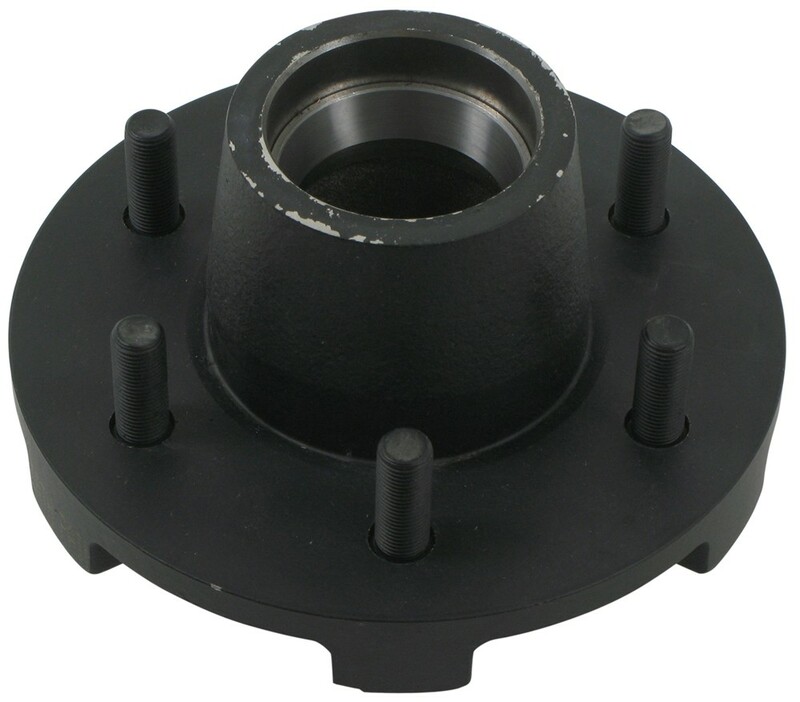 All of our hub assemblies that we sell from eTrailer will include the bearing races preinstalled into the hub. You can see here is the outer bearing race. In the end right there is the inner bearing race, and again, we mentioned this is a 6 on 5-1/2-inch bolt pattern and the best way to measure that--usually, on a hub that will have six lugs, an even amount of lugs, you could just measure across from one center of one lug bolt to the center of the other and that would give you the 5-1/2-inch measurement. Because this hub sticks up so high, it will be hard to get a measurement that way. So the next best way is if you measure from the center of one stud to the center of one right next to it either way. It would measure 2-3/4 inches and if you go to the product page for this part number at the bottom of the page, it will show you determining the bolt pattern and there will be a chart that says when you measure from one stud next to the next stud if it measures 2-3/4 inches. That would be a 6 on 5-1/2-inch bolt pattern. And that should do it for the review on part number 42655UC1. Order: RelevanceNewestRating - High to LowRating - Low to High Hub is designed for use on trailer idler axles. Fits 6,000-lb axles with #42 spindles. Inner bearing (25580) and race, outer bearing (15123) and race, grease seal, grease cap, wheel bolts, and lug nuts included. Do you have a question about this Trailer Hubs and Drum? Square axles are hard to find capacities for as they don't have a standard capacity based on dimension like round axles. Since I can see a 4 bolt mounting flange for a brake assembly that means the max it woudl be rated for would be 3,500 lbs. Between 2,200 lb and 3,500 lb would be about as close as I can say. Which Hub Do I Need for the R50642 Spindle. The hub you will need for the Spindle 2.25 inch RD x 6 inch STUB, item # R50642, is the Trailer Hub Assembly - 5,200 & 6,000 lbs Axles - 6 on 5-1/2, item # 42655UC1. Based on the axle diameter, wheel bolt pattern, and bearings you have it sounds like you have a 5,200 pound axle, which is a de-rated 6,000 pound axles. So they share many of the same parts. There is likely a tag on the axle somewhere that indicates its capacity. This information could also be on a sticker or plate at the front of the trailer on the frame or tongue somewhere. Typically a 1-3/4 inch outer diameter axle is going to have a 2,000 lb capacity. Based on that and the wheels you have that would be a pretty safe assumption. Based on the 8-3/4 inch circumference you listed (and a little algebra), I was able to determine that your axle diameter is 2-3/4 inches. Which is an interesting size considering most 2-3/8 inch axles are 3,500 capacity axles and most 3 inch axles are 6k to 7k capacity. 2-3/4 inch diameter axles aren't standard size axles. I would err on the side of caution and say they are most likely around 3,500 lb capacities. Your trailer will have a GVWR and dry weight. All you need to do is take the GVWR and subtract the trailer's dry weight, and it will give you the carrying capacity of the trailer. If you are going to shorten a trailer axle it's best to take the length out from the center of the axle. Reason being that most of the weight is carried on the outside portion of the axles. Three inch diameter axles could have a weight capacity as low as 3500 lbs and as high as 7200 lbs. For your situation the best way to determine your axle weight capacity is by using the part numbers of the inner and outer bearings in the hub. I attached a photo that shows you where you can locate the part number on your bearings. With this information we can give you a more accurate weight capacity. 2-3/8 inch diameter axles are 3,500 lb axles. 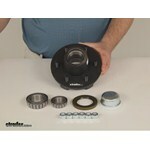 If you happen to be looking for a replacement 3,500 lb hub we have several at the attached link. The most popular being the part # AKHD-545-35-EZ-K. Highest quality trailer hubs and drums for the best price. Most detailed, accurate trailer hubs and drum information available.